"If you don't like that, then don't smuggle children over our border," the attorney general said Monday at a law enforcement conference. "If you cross this border unlawfully, then we will prosecute you. It's that simple," Sessions said. Adults charged with illegal entry will be turned over to U.S. marshals and sent directly to federal court. Their children will be transferred to the Office of Refugee Resettlement, part of the Department of Health and Human Services, which refers them to relatives in the U.S. or to shelters run by private organizations. The Department of Homeland Security says 700 children have been separated from their parents since the fiscal year began last October. A first conviction for illegal entry carries a maximum jail term of six months. DHS officials said adults have been separated from children in the past if border officers could not be certain that they were actually the parents of the children accompanying them or if the adults were prosecuted for a crime. "I want to be clear. DHS does not have a blanket policy on separating families as a deterrent," said Thomas Homan, deputy director of Immigration and Customs Enforcement. "There is no new policy. This has always been the policy. But you will see more prosecutions because of the commitment to zero tolerance" of illegal border entries. The tougher enforcement policy is another attempt to reduce the flow of illegal immigration from Guatemala, Honduras and El Salvador. Customs and Border Protection says the number of attempted border crossings by people found to be inadmissible was three times higher in April than it was during the same month last year. 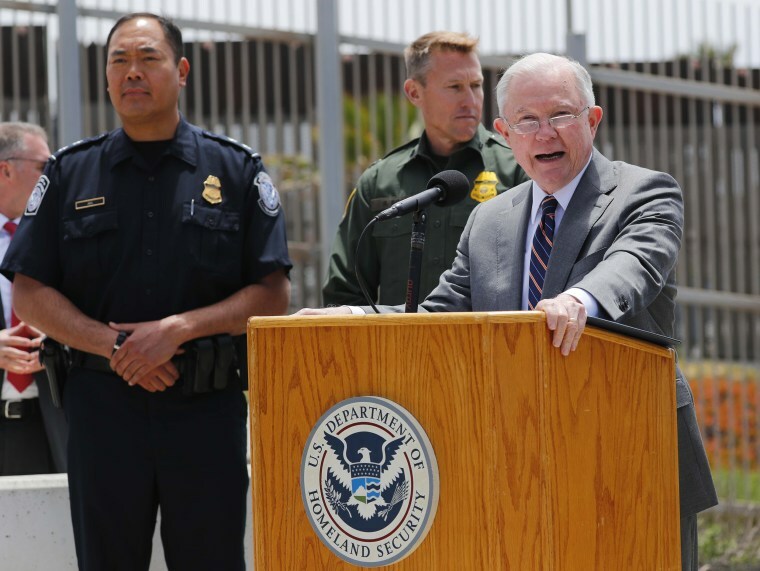 "We are dealing with a massive influx of illegal aliens across our Southwest border," Sessions said. "But we're not going to stand for this." Last week, he sent 35 federal prosecutors to the Southwest border region and 18 immigration judges to help deal with the increase in expected border crossing cases. The new approach applies only to people arrested for attempting to enter the U.S. illegally. The children of adults who present themselves at a designated port of entry and seek asylum will not be separated from their parents, administration officials said. Opponents of the tougher enforcement policy strongly condemned the new approach. "This administration is set on tearing families apart, detaining immigrants without justification," said Vedant Patel of the Democratic National Committee.